I really love when I find a great recipe that’s 5 ingredients or less. 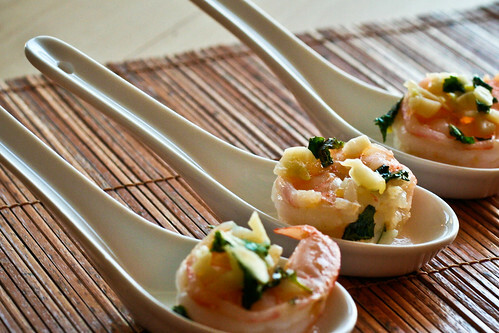 These Garlic & Mint Shrimp are simple, ambulance easy and really delicious. I had actually planned on making and mint gremolata for some grilled lamb chops, but the grocery store let me down. No lamb chops for me. Instead, I found some nice looking shrimp and decided to saute those in garlic and olive oil, then toss them with mint. The mint lends a refreshing flavor to the whole dish. We ate them alone as an appetizer, then tossed the leftovers with jasmine rice for a really quick and tasty meal that’s perfect for Spring and Summer. They’d also be delicious tossed with some pasta, orzo or even farro. Next time, I think I’ll also add some thinly sliced hot peppers for a little bit of a kick or some bacon. Everything is better with bacon. Although I had really been hoping for that lamb, I’m glad the grocery store was out. I love everything about these shrimp, and I really love their simple goodness. Place the cleaned shrimp in a bowl with half the olive oil, the garlic, hot peppers and salt. If you have time, let them marinate for 30 – 60 minutes. If not, just let them sit for 5 minutes or so. When you’re about to eat, heat a large skillet or wok over medium-high heat. Once it’s hot, heat the remainder of the olive oil. Empty the contents of the bowl into the skillet and cook for 5 – 7 minutes, or until the shrimp are cooked through, but not overdone. You’ll want to remove them just after they turn completely opaque. Remove the skillet from the heat and toss everything with the mint leaves. Serve immediately. Makes 4 entree portions if served with jasmine rice or pasta. Makes 10 – 12 appetizer portions. And the best part is that you’ve paired a breath killer with a breath freshener. Was that planned?